Mi A2 offer: well we all know that mi a1 is best-selling device globally, based on android one platform. And now Mi A2 has been officially announced by xiaomi. As per xiaomi India head, Manu Jain has launched mi a2 in India on 8th August at price of Rs.17499. for a limited period time, you can buy it for Rs.15999. Mi a2 offers great features such as 5.99" fullhd+ display, Snapdragon 660 soc, dual 12mp + 20mp rear cameras, 20 mp selfie camera, 3010mah battery, 4gb RAM/64gb ROM or 6gb/128gb, android one & more. Like mi a1, Xiaomi will launch mi a2 exclusively at Amazon. Mi A2 price in India is Rs.11999 for 4gb+64gb variant. Shop now! How to Avail Free 1 Yr Screen Replacement Offer? Mi A2 Discount: Is there any Discount on Mi A2 ? How is Mi A2 Different from Mi 6X? Is Mi A2 a Good Deal? Amazon Festival Sale is offering free 1-year screen replacement powered by Acko. So, Buy Xiaomi Mi A2 this festive season and get your screen replaced, free of cost, in case of any breakage. This offer is valid from 9th October till 15th October. So, what are you waiting for? Order your Mi A2 Today and grab this money-saving deal with free mobile insurance by acko. Go to the product page of any phone. Check for this particular offer at the top of the page to check eligibility. Add the phone to cart & complete the purchase. Your free 1 year screen protection plan will be auto activated, and sent via mail & SMS. How Much You Save with Amazon Screen Replacement Offer? Like we all know Xiaomi sale strategy, They sell almost every Mobile Phones in India under Flash sale for the early stage & later on they make available for Normal Sale. So we can expect the same with Mi A2, which will be sold in India though Flash, on a later date may available for Normal sale. Rs.2,200 Instant Cashback and up to 4.5 TB 4G Data only with Jio. Secure your phone against accidental & liquid damages with Mi Protect. Starting at ?999. Just After Mi A2 Global Launch, Xiaomi India Head Manu Kumar Jain has confirmed through Social Media Platform, Mi A2 is coming to India on 8th August. Xiaomi and Amazon Partnership is one of the most successful partnership in India which heps Xiaomi to disrupt the smartphone market in India. The same with Xiaomi & Flipkart together done with Mobile & TV Sales in India. Like the previous year we are expecting the same that Mi A2 will be sale through Flipkart but Xiaomi has changed their mind and partedrd with Amazon India to sell Mi A2. So, Xiaomi will sell Mi A2 Online exclusively at Amazon.in.So whenever they officially launch Mi A2 in India, we will update you regarding Mi A2 Next Sale on Aamazon or Flipkart. Mi A2 may be avaailble on Flipkart too on later date or during sale period. Stay tuned. Now Xiaomi sale their mobiles & other ecosystem products in India through both Online & offline channels. That includes Mi.com, Flipkart.com, Amazon.in for Online sale & Mi Home, Mi Preferred partners for Offline sale. But Mi A2 will be exclusive to Amazon, So Xiaomi will Sale Mi A2 via Amazon.in, Mi.com & through an Offline channel on later date. Usually, Xiaomi doesn't give any discount on any Mobile Phone at an early stage. But we can expect Bank Special offer, Discount on Mi A2 if Amazon or Flipkart provides during special events such as Amazon Great Indian Sale, Amazon Festival Sale, Amazon Prime Day Sale, Flipkart Big Freedom Sale, Flipkart Big Billion Days. You can get discount/price cut on Mi A2 by Xiaomi whenever a new phone of similar specification & price is about to launch. The hardware part of Mi A2 & Mi 6X is same. The Only difference between Mi A2 & 6X software part. Mi 6X runs on Xiaomi custom UI called MIUI and Mi A2 is runs on Android One Platform. Mi 6X only limited to China, Where in Global Markets including India Mi A2 will be available. As Mi A2 will be based on Android One so you get regular updates directly from Google. Xiaomi always gives Great Quality Products at aggressive pricing. 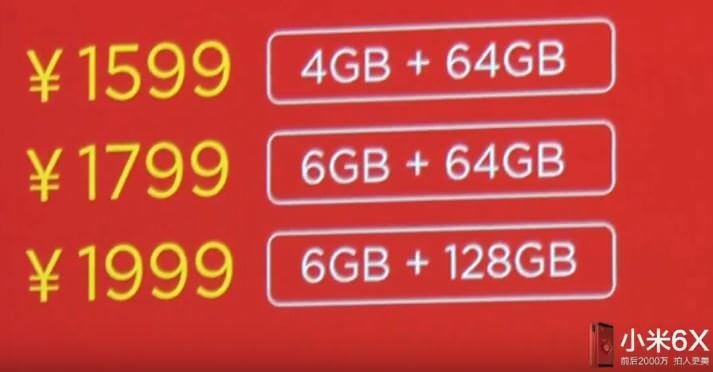 if you compare the Chinese pricing of Xiaomi Mi Phones with India pricing, then you will get to know that almost at the same price we get the same device in India. So, we could expect Mi A2 to priced Price in India at Rs.16999 for 4GB+64GB variant & Rs.20999 for 6GB+128GB variant. Considering specification & overall performance, Xiaomi Mi A2 will be a good deal for the Price. Stay tuned for the official announcement of Mi A2 & more Info.